Spookers Halloween may also collect aggregated data, which is data from which the identity of an individual cannot be determined. Since it is not personal information, Spookers Halloween may use aggregated data in any way that it considers appropriate. 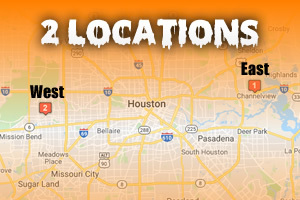 * Process and manage your purchase of Spookers Halloween products and services. In the event of a sale of some or all of our business, Spookers Halloween may disclose personal information to those involved in a transfer of all or part of the assets or business. You can choose to have your computer warn you each time a cookie is being sent or you can choose to turn off all cookies. You do this through your browser (like Firefox or Internet Explorer) settings. Each browser is a little different, so look at your browser Help menu to learn the correct way to modify your cookie settings. If you turn cookies off, you won't have access to many features that make your site experience more efficient and some of our services will not function properly. Information from children Spookers Halloween is not designed nor intended to collect personal information from people under the age of 21. Spookers Halloween does not knowingly collect personal information from anyone under the age of 21, and does not use such information if it discovers that it is has been provided.